This week’s fashionplate features our Donna ribbon trim cami at Bar Gonzo. I met a friend at Bar Gonzo for happy hour on National Margarita day. By now you should know I love tequila and more specifically margaritas. It was a rainy, dreary day so the bar wasn’t super crowded and we ended up getting a table to catch up. I of course ordered a yuzu shiso margarita which was great. She stuck to vodka sodas because she is on the bride diet. They gave us complimentary fried green bananas which were good and similar to plantain chips but fresh and homemade. We got the pizza of the day which had tomato sauce, mozzarella and pesto and was a similar to a French bread pizza. It reminded me of my fav after school snack as a kid and was delish. We also got the beef skewers which were good but a small portion. I stuck the marg for my drinkies and she stuck with her vodka sodas. Their happy hour specials are great and the space is trippy and cool and Hunter S Thompson inspired. See all the ootd and meal deets for this fashionplate below. The latest fashionplate features our Natalie blouse at Street Taco. Met one of the girls here for an overdo catch up session over our fav mexican food. When we arrived here on a Thursday evening after 8pm it was packed and she snagged two seats at the bar so we ordered some margs while waiting for our table. They have a cute little taco truck in the back of the restaurant. We started with the nachos which were our favorite part of the meal- a sheet tray full of cheese covered chips and all the goodies. Of course we got more margs and we also got 2 tacos each. We both got the chorizo which was solid. I also got the blackened fish which was kinda lackluster. She enjoyed her pork belly taco a lot. The crowd skewed young with fresh out of college young professionals of the bro variety. Would go back for happy hour but so many other Mexican places around so not at the top of our list for a repeat. See how I styled this fashionplate below. The latest fashionplate features our Chambray shirtdress at Gallo de Oro. Got some margs and Mexican here after a day of sourcing, an early dinner of sorts. We ended up eating outside. Of course I had to get a margarita and it was happy hour, so cheap and strong. We started with some queso which was bit too liquidy for my taste but I ate it anyway because I don’t let cheese go to waste. We got the chicken quesadillas which needed more cheese. The chorzio tacos were the best thing we got. This place wasn’t very crowded so maybe my fault for going here. This place was meh, so many other mexican places have better food than here plus outdoor seating. See how I styled my fashionplate below. Check out the latest fashionplate featuring our new grey cropped hoodie that is the epitome of casual luxury at Guac, a fun Mexican spot in Alphabet City. Met a friend here for national margarita day because you know margs are my fav even when it’s cold. We ended up just sitting at the bar and ordered don julio margs no salt. We sampled a few apps as well. The bacon guac is amazing. Yum! And the nachos were great too, they were a little higher end than your typical bar nachos and had great flavors going on. It wasn’t that crowded, seems like more of local spot. They also have an aycd brunch which I definitely will be back for. See how I styled this fashionplate below with all the ootd deets. This week’s fashionplate features our Chrissie black and white cross print bodysuit at new creative Mexican cuisine Temerario in Chelsea. This spot is close to my apartment so my dining companion and me decided to check it out on a low key Monday evening. I love all the cool colorful street art very fun. The restaurant was not very full so we were seated right away. I was excited that they had Casa Dragones tequila so I ordered the Mexi Dragones cocktail that had a spicy kick. My dining companion got a larger sized Nopal salad which he enjoyed. I got a few small things. My scallop ceviche was fresh and very good. I also got the quesdillas which were very good and not greasy. A side of beans completed our meal which were solid. My only gripe is everything came so fast, too fast we were in and out in under an hour which is good during a lunchtime rush when need to get back to the office but not so good when you want to have a dinner out and catch up. See how I styled this fashionplate below. This week’s fashionplate features a few of my favorite things- our Sophia eggplants cami, margaritas, and queso. My dining companion and I were starving after getting my hair did. I love all things Mexican and tex-mex so I knew we had to hit up Avenida Cantina. We were promptly seated and I ordered a marg, obvi, and he got a rum punch. We started with the Big Al’s Special queso which was super yummy with the chorizo in the melty cheese. The complimentary salsa was also pretty solid. I went with the frito pie enchiladas with white queso, jalapenos and sour cream on top because you might as well treat yo self. My dining companion got a steak burrito with queso and sour cream on top. Needless to say we were both in food coma after our entrees and more drinks. I loved my Austin-esque enchies and the re-fried beans have more chorizo on them when is amazing. The crowd is a mix of locals and a few of the new East Village types, you know what I mean. This is a totally casual and comfy place. After finishing our fattoush meal, we went downstairs to check out their cocktail spot Mockingbird Bar, where we sampled a few of the cocktails, all of which we liked. The bartenders were chill and fun. I definitely will be back. See how I styled my Sophia cami for this fashionplate below. 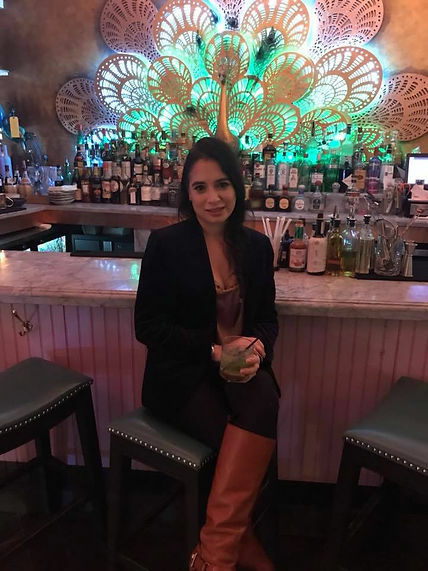 This week’s fashionplate takes us to a place with my favorite summertime drinks- margaritas at a new Hell Kitchens tex mex place- El Original. Upon meeting my bestie here the space is huge and not crowded at all. Of course we started with margaritas on the rocks and my friend got a a Mexican coke too. We split the happy hour trio of queso, guac and salsa. The queso was solid, the guacamole could’ve been spicier but was a good starter. My bestie went for the chicken enchiladas while I went for the beef with extra queso on top. Can you tell I love cheese yet? Both enchiladas were solid but not anything amazing. The rice and beans were standard sides but didn’t stand out. Now on to the fashion part of the fashionplate. The place is huge so it wasn’t very crowded. There were mostly tourists and a few locals/people who work in the area, so dress veered towards casual or work attire. See how I rocked our Farrah knit romper below. This week’s fashionplate is a fun casual spot Mexique in the Nomad area. I decided to wear the shorts from the Christi two piece outfit for a perf summertime look. I have been to the takeout location many times before and this full service restaurant twice before. It’s a large place with a wooden bar and wood table and eclectic chairs and booths. I always need to get the queso here, it’s highly addictive. I also love their margaritas, although sometimes I am that girl who asks for Casamigos blanco with just lime juice and agave for a less sugary marg. My friends all love this place. I love the burnt end brisket bowl, the jamburrito and the mac and cheese. Last time we went my friend got the kale and greens bowl which is very yummy too! It’s the perfect place for a fun lunch or a quick dinner, they aren’t that crowded during dinnertime during the week. The crowd is mostly professionals who work in the area. See how I paired the Christi shorts below.